From beginning his rugby journey at Kirkham Grammar School to an eye-catching display in Europe, Kieran Wilkinson is starting to turn heads. 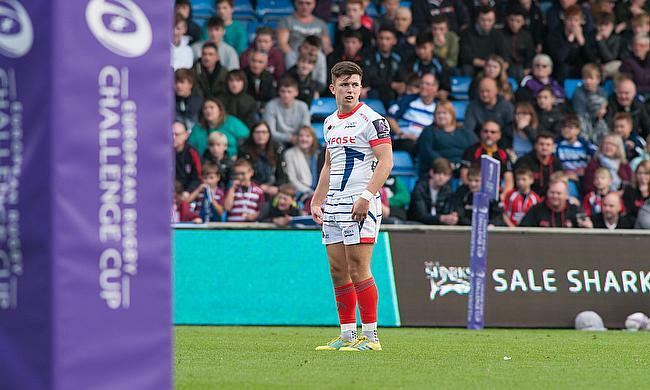 Sale Sharks’ 19-year-old fly-half is one of the latest talents to be showcased by the Manchester-based club. After making two starts in the Anglo-Welsh Cup last season, he was handed his first major opportunity at the beginning of October. Back to back appearances in the Challenge Cup were followed by consecutive games in the Premiership Cup as Sale’s season begins to click into gear. It’s been a month which Wilkinson won’t forget in a hurry and his recent display against Perpignan stands out from the rest, as he helped guide Sale to an excellent 41-24 victory in the south of France. Reflecting on the last five weeks, Wilkinson said. “I guess it has gone really well. I have been given opportunities and I think I have been able to take them. Dimes [Steve Diamond] seems to be happy with me. It has gone well and I’ve really enjoyed it. “It is a massive confidence booster, really. Knowing the coaches have got your back and they are picking you on a consecutive basis is really good. Rugby is about confidence so it has helped me. His recent opportunities arose following the news of AJ MacGinty’s shoulder surgery (which is set to keep the American out until the new year) and it looks as though Wilkinson has made the right impression at the AJ Bell. “It [gaining opportunities] is huge,” Wilkinson told TRU earlier this week. “Sale is a really good place to be at the moment. The young players are getting a lot of opportunities to show what we can do and it is up to you to take those chances and I hope I have done. For now, Wilkinson has Premiership Cup games against Worcester Warriors (where he kicked his first points for the club), Saracens and Leicester Tigers under his belt and after also gracing the European scene, the skilful back is experiencing the big stage once again. Whilst progressing through the ranks in the Sale academy, Wilkinson was selected for England's U17s and was also in the U18’s squad for this year's Six Nations as well as being involved in recent tournaments in France and South Africa. It’s evident, more so after his recent displays for Sale, that Wilkinson is comfortable when the pressure is on, but he will be the first to admit that his nerves were jangling when he took part in a kicking session alongside his hero. During his time with England at U17 level, Wilkinson shared the training field with World Cup winner and namesake Jonny Wilkinson. “It was really overwhelming, but you had to keep a calm head," he said. “You just wanted to learn from the master and it was a moment in my career that I won’t forget for a long time! Your England U18 squad for 2018 ?? After spending some time with England’s record-points scorer, Wilkinson has gained some wisdom from one of the greats of the game, but his current club environment also allows the young fly-half to learn from some quality players. Wilkinson wasn’t at Sale when Danny Cipriani was plying his trade in the north-west, but he revealed that watching the 31-year-old only increased his hunger to succeed. And even now, with the recent acquisition of Currie Cup winner Rob Du Preez alongside the likes of Chris Ashton, Faf De Klerk and James O’Connor, Wilkinson is surrounded by some of the Gallagher Premiership’s star talent. Wilkinson's development isn’t just based around Sale’s first-team, though. He has also made a handful of appearances for Sale FC in National One this season which, over the last few years, has given some of the academy players a chance to gain experience as well as game time. The Curry twins (Tom and Ben) as well as Luke James, Paolo Odogwu and Arron Reed are just recent examples of players who have appeared in the National Leagues whilst also being on the books at the Sharks and Wilkinson feels Sale FC is a good place to continue learning. Following a breakthrough month and with National League rugby on the side, Wilkinson is now keen to build on a very encouraging start to the campaign. Asked what his aims were for this season, Wilkinson concluded: “It is about getting better every day and taking everything in. I can’t get too ahead of myself, but I just want to keep learning. It is a big thing for me. He has certainly taken his chances up to now and a fly-half by the name of Wilkinson is starting to emerge once again.